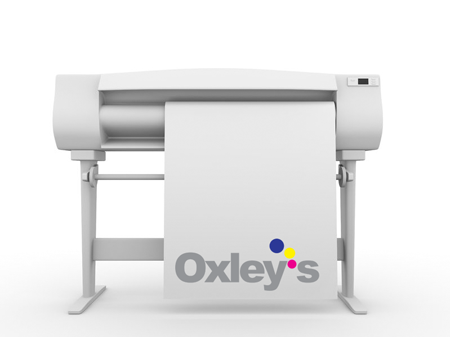 Oxleys Specialise in HP Designjet plotter repairs and service across Birmingham, the West Midlands and from 2017, are now covering parts of the East Midlands! If your HP Designjet large format plotter requires a service, or has a fault, call our technical help desk for a quick fault diagnosis over the phone now. All our engineers are fully trained and carry a comprehensive parts stock to get you back printing the same day. HP Designjet error codes can quickly be diagnosed to ensure an engineer is dispatched with the relevant parts, quickly giving you an efficient first time fix; for designjet error codes and a fault explanation call now. We can service and repair HP Designjet plotters, at a realistic cost, using our expertise in plotter servicing and repairs, from years of experience. Annual Maintenance Contracts can be taken out giving you peace of mind that if your Hewlett Packard Designjet printer is broken, and let's you down, we can respond same day and get you back in full productivity within hours, fully inclusive of all parts and labour, from £200 per annum. HP large format printers are key to many organisations such as architects and the building industry, and down time is critical. 10% of our enquiries are cleared over the phone for free from our vast knowledge of HP Designjet faults and years of experience dealing with hp designjet faults and error codes. Call us now for reliable technical support, hp plotter servicing and plotter repairs for your HP Designjet plotter in the Midlands area. If you need HP Plotter maintenance call the HP designjet specialists now for a fast professional repair from a company you can trust, at a competitive price. hp printer repairs, large format plotter repairs and service all carried out on site and credit accounts available on request. See our Contact page for further details.